Expert Criminal Analysis: Get the Facts! Expert Investigator is a custom Topic Module for ThoughtOffice, designed to help you get to the bottom of any mystery, crime or conundrum (or help writers craft stories along these lines with near scientific accuracy). Solving a mystery is as “simple” as reconstructing a story using the most basic building blocks: who, what, where, when, why and how. The complexity of the mystery depends on how much of the basic information is known at the beginning of the investigation. 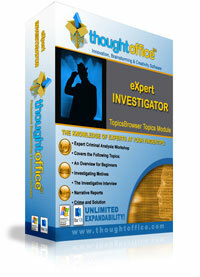 Whether you’re a professional private investigator or simply trying to find out who left the cap off of the toothpaste again, ThoughtOffice’s Expert Investigator can help you learn and develop the skills needed to nab the guilty party every time. The Expert Investigator plug-in guides you through a logical progression of questions, helping you to achieve a single-minded focus on the facts without prejudice or bias, but with a healthy amount of skepticism (channeling Columbo or Jim Rockford would be helpful, though difficult). Your own curiosity, tenacity and resolve as a detective will be sparked by the as-yet unanswered questions, leading you to form an initial hypothesis for those unknowns. This is where you get to unleash your deviously creative mind: Who would do such a thing? Why would they ever do such a thing? How could they do such a thing? The development of your hypothesis is supported by exploring the plausible motivations and actions of your theoretical suspect. ThoughtOffice’s Private Investigator module then helps you process the information you gather through interviews, surveillance and other investigative procedures. You can do this. Observation is defined as perception plus attention. Sifting through your findings like a bloodhound on the scent, you will use ThoughtOffice’s exhaustive series of questions, prompts, and ideas to help you delineate fact from fiction in your systematic search for evidence. Once you have verified and / or corroborated your cache of facts, you’re prepared to start making conclusions and testing your hypotheses. You will sharpen your critical thinking skills, inductive and deductive reasoning, analytical assessment and above all else, your ability to remain open minded to any twists and turns your investigation may unveil with ThoughtOffice’s Private Investigator module. 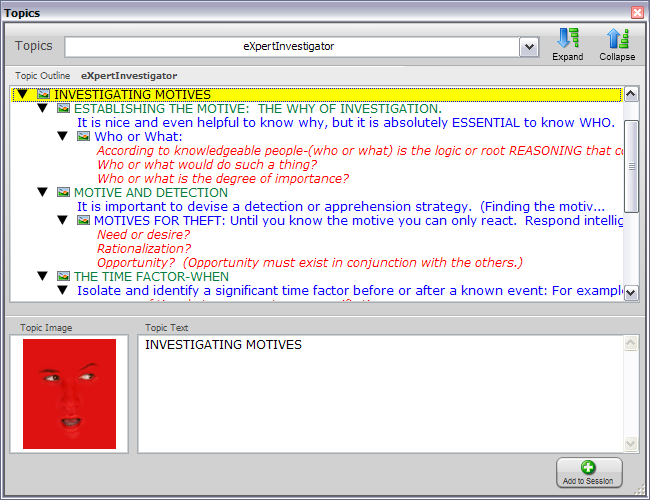 Your interaction with the program will train you to consider every possible aspect of every stage of your investigation. On what evidence have I based my conclusion? Do I have enough evidence? Have I considered negative evidence-i.e. evidence, which might point toward a different conclusion? Is this the only possible conclusion that can be drawn? Would others, given the same evidence, arrive at the same conclusion? Nicholas Cannon’s Private Investigation Module is a clear, step-by-step program for evaluating, clarifying and exposing both your initial hypothesis, and any of the myriad of details that surround any case. ThoughtOffice Expert Investigator represents his 18+ years in the field and in court, and covers nearly every aspect of the investigative process. 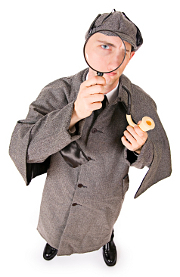 Wondering how we’re qualified to assist you in the art of investigation? Nicholas Cannon authored this module and brings with him over five years of law enforcement experience and more than a dozen years in private investigation. In addition, Cannon has been a County Probation Group Supervisor, Veterans Administration Police Officer and Chairman of the Police Commission. He currently is a licensed California Private Investigator and holds a Bachelor of Arts in Sociology. Mr. Cannon has extensive experience in human relations, vast knowledge of human behavior, and superior scientific fact-finding skills. He was recently invited to help plan a new entrance exam for would-be California Licensed Investigators.